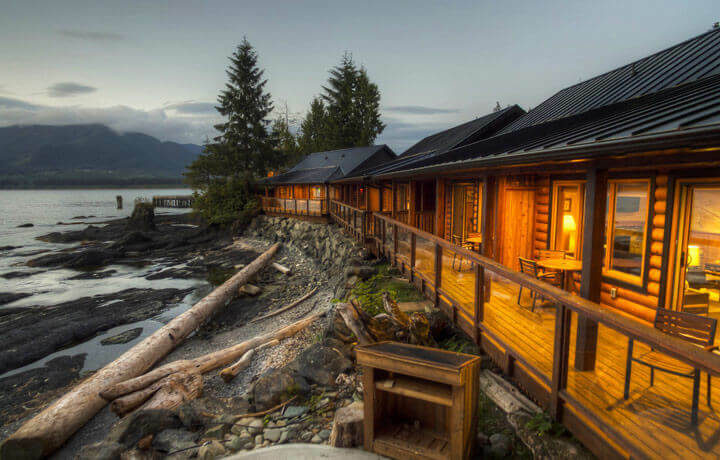 Vancouver Island has it all—from the oh-so-British charm of capital city Victoria to the lush green rainforests and wild trails of the Pacific Northwest coast—in my opinion, it doesn’t get any better than this. From laid-back city life to the best of West Coast nature, here are some of my favourite ways to make the most of every aspect of the island. 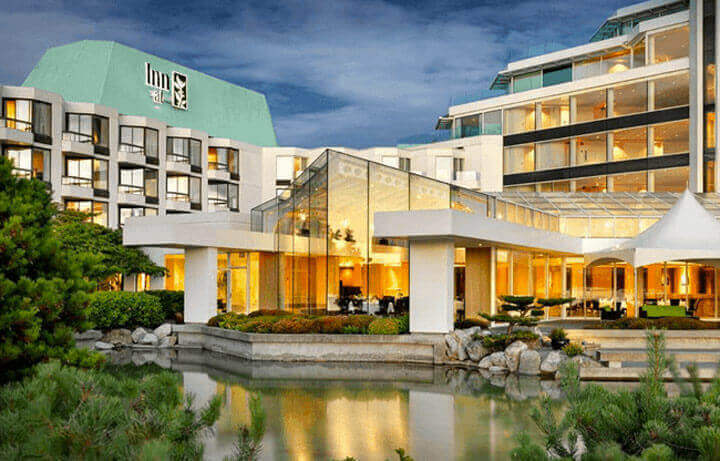 The capital city of British Columbia, Victoria is a charming city with one of the most temperate climates in the country, thanks to its status as the southernmost city in Western Canada (there’s hardly any snow!). Known as the ‘Garden City’, it’s easily accessible by ferry, seaplane, commercial air or heli-jet from Vancouver and the mainland. Situated in the beautiful Inner Harbour, Victoria is said to be one of the most British cities in Canada, as evidenced by its name, inspired by Queen Victoria. First established in 1843, this is one of the oldest settlements in what was then known as British North America. The grand buildings of the B.C. Parliament are the centre of government of the province of British Columbia. The neo-baroque buildings were completed in 1897, designed by the young architect Francis Rattenbury, a 25-year-old English immigrant, who entered an architectural competition and won the commission. Prominent statues include Queen Victoria on the front lawn, as well as a gilded statue of Captain George Vancouver, who tops the central dome; there is a single statue of a solder to commemorate those who served in the First and Second World Wars and the Korean War. One of Victoria’s top attractions, the Butchart Gardens were established by Jennie Butchart, the wife of a wealthy cement producer. Former limestone quarries were turned into extravagant ornamental gardens, among them a Japanese garden, an Italian garden, and a large rose garden in the English Arts and Crafts style. The year-round attraction is a delight in all seasons, from the fresh tulips and cherry blossoms of spring to the profusion of colour in the summer (and evening displays of lights and fireworks). Autumn’s fall colours and leaves make way for winter’s subtlety and the festivities of Christmas. Some incredibly rare blooms can be found growing here, including the notoriously finicky Himalayan blue poppy. For breakfast, head to Cora’s, which hands down has the best breakfast in town and the friendliest servers. For a spot of tea or coffee, make your way to Murchies in downtown Victoria. These old-style English tea and coffee merchants have been in Victoria since 1894, and this shop has been run by the Murchie family ever since. It’s great for souvenirs and gifts, or a quick bite. There are so many choices in town, but one of my favourites is Fish Hook—an incredible fusion of Indian and Pacific Northwest seafood. Nearly impossible to imagine, but it just works. (My favourite: the smoked sablefish pakoras.) Or try vindaloo-spiced mussels for another dish that can’t be replicated elsewhere. I’m also a sucker for Lure, which has an excellent harbourside location; I really love the airy and bright room, combined with Pacific Northwest bistro-style food. The best way to arrive here is by mini tugboat/water taxi, which whisks you right to the restaurant’s dock! I also love it here for cocktails in the warmer months; head to the comfy couches and lounge by the water, sipping at your leisure. Here’s one of my secrets: the absolute best ice cream sandwiches can be found here, suitable for vegans and non-vegans alike. Situated in retro-style hipster digs, this store has over 400 flavours in their archive (but not served all at once—and they’re a bit kooky, as there is even a Douglas Fir-flavoured option). My favourites are the Golden Graham, a salted caramel ice cream surrounded by a graham crumb cookie masterpiece of flavours, or rosemary and sour cherry ice cream in a vanilla biscuit. For a grand experience, do not pass up this quintessentially British tradition. An emblem of the city, the hotel’s ivy-covered façade has welcomed visitors to Victoria since 1908. As I like to tell people, it’s ‘more British than Britain’. Sip your tea from a bone china cup while nibbling on tea goodies like crustless watercress sandwiches or butter scones with strawberry jam and oh-so-traditional clotted cream. Showcasing the very best of Pacific Rim regional cuisine, with an Asian-influenced menu, you’ll find Aura a little more formal, but spectacular for its twinkling harbourside setting. For those wanting fresh fish, you’ll also see sushi popping up and ‘SeaCuterie’ (Italian-inspired cured meats created from seafood instead of game) as an intriguing way to begin your meal. My favourite restaurant for a lovely night out on the town is OLO. Look forward to dining on sophisticated, high-quality Pacific northwest farm-to-table (or sea-to-table) fare, and eclectic cocktails. From inland to the briny, bountiful flavours of the sea, the freshness is inherent in every bite. From the ‘little Britain’ feeling of Victoria, B.C.’s capital, to the wild nature along the coastline, with its sparkling tidal pools, sunken ships, old-growth forests with centuries-old trees, our Vancouver Island Family Adventure will leave you wanting more of Canada’s ‘best coast’. From hundreds of shipwrecks in the ‘Graveyard of the Pacific’ to spiritual, sacred old-growth forests and tidal pools brimming with marine life, it’s all about sea, sky, and forest in these parts. Turn off and tune into the rhythms of nature instead of your phone. The Pacific Rim West Coast Trail is an ancient path first used by First Nations peoples. This rambling trail along the coastline runs for 75 km (47 mi). With temperate rainforest, sandstone, dramatic cliffs and beaches along the way. This is also where the infamous stretch of the ‘Graveyard of the Pacific’ can be found. Hundreds of ships met their end along the rugged coastline, northerly current, and unpredictable combination of waves, fog, current and wind. With so many of us living in urban environments, the Japanese practice of ‘forest bathing’ (or simply, being in nature) has benefits for your physiological and psychological health. Near Port Renfrew, the Avatar Grove is a famous old-growth forest filled with incredible, thousand-year-old cedars and Douglas firs. The lower and upper groves are both worth visiting; with massive, gnarled trees (including an old cedar billed as ‘Canada’s Gnarliest Tree’) rising high, ferns, moss, and a few beautiful rivers on the way there, this spiritual place is one you won’t soon forget. Another place for forest immersion, prepare yourself for shades of green, shadows and textured bark, with moss coating the trees and the rich smell of soil and fresh air, it’s as if you’ve stepped into an Emily Carr painting. This sanctuary—enclosed in an ecosystem that has remained untouched for hundreds of years–features some of the world’s largest spruce trees, some older than 800 years old and stretching taller than 95 metres (over 300 feet). Ancient cedars well over 1,000 years old complement the picture, along with diverse flora and fauna at every step. From roaring surf to incredible old-growth forests, tidal pools, shale and quartz formations, and nature’s drama at its finest, this provincial park along the west coast of Vancouver Island delivers quintessential ‘PNW’ magic. At one end of the Juan de Fuca Trail, Botanical Beach Provincial Park is where you’ll find one of the richest tidal areas on the west coast. These incredible sandstone-and-granite pools are filled with colourful sea anemones sending out their flowery tendrils in the water and flowing with the tides, you’ll also see starfish, shells, crabs, barnacles, kelp, and more. It’s a really cool experience for families (or wannabe marine biologists), but take care only to look and not touch; these sensitive environments can be easily damaged (for instance – a film of sunscreen on your hand, if dipped in the water, could destroy the habitat in a pool). One of the world’s best places to whale-watch, you’re in for a treat. Several orca pods live along the coast of Vancouver Island, and you may have a chance to see humpback whales, minke and gray whales in season. Of the other marine animals, sea lions are the most entertaining; hear, see (and smell—your boat will get that close) these social animals gather in massive groups to frolic, bark, sun themselves, and haul themselves in and out of the water. A quiet oceanside retreat in B.C.’s capital city, enjoy the harbour view from your private patio and listen to the quiet song of distant geese and sailboat rigs clinking in the breeze. The restaurant Aura, which I mentioned previously, has great cocktails and a superb waterside lounge area for sunset-viewing. (they make the best in town)! 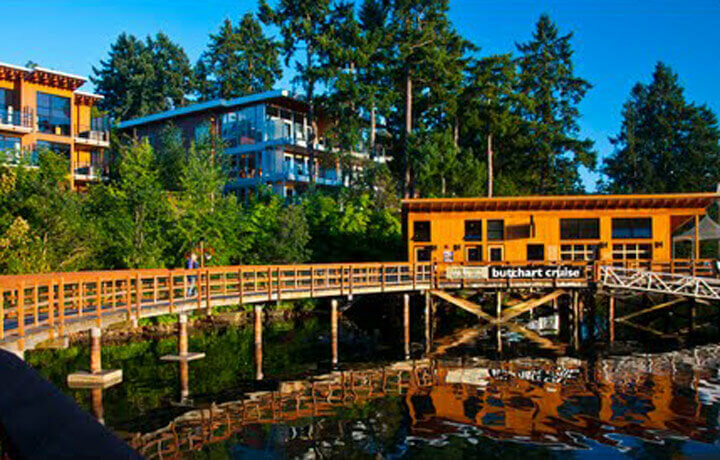 A unique hotel on Vancouver Island, this charming oasis on Whiffen Spit is a place where you will be greeted with a glass of locally produced blackberry port and set free to explore the artwork and local antiques that occupy the living areas. 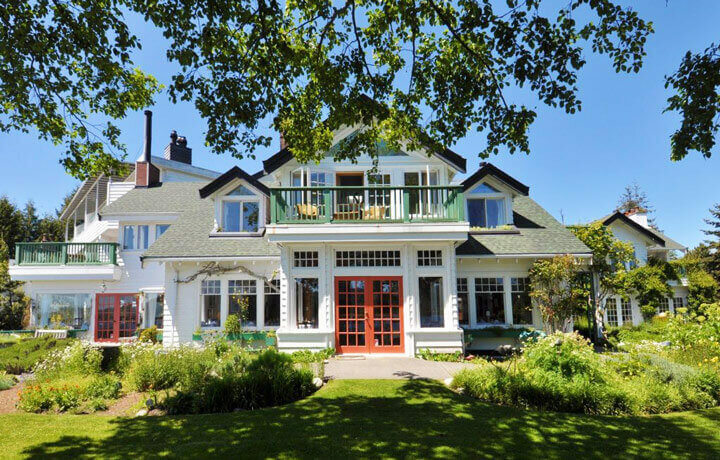 The culinary program at Sooke Harbour House was one of the very first to put B.C. regional cuisine on the map. Don’t forget to take in the spectacular views of the Juan de Fuca Strait and the Olympic Mountains! This secluded and plush log cabin property allows you to get cozy and enjoy all the comforts of home without sacrificing your wild side…you can look forward to stunning views from your own private deck. Unplug your phone—its remote location makes for an authentic-feeling stay. The food is equally impressive at the resort’s friendly pub.